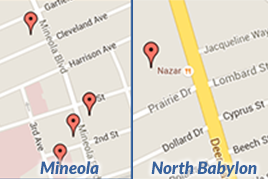 We currently have two locations in Mineola and North Babylon. We have office hours between 9am-5pm. We also have additional evening and weekend hours available in both locations. Please call the office to schedule your appointment. What tests is my child going to have? Your child will have a complete physical examination including height, weight and blood pressure readings, an electrocardiogram (recording of the heart rhythm), and an echocardiogram (sonogram of the heart). Additional testing may include: a Holter monitor (24 hour recording of the heart rhythm), an event monitor (recording the heart rhythm during symptoms), and an exercise stress test (monitoring of the heart rate and rhythm during exercise on a treadmill). Appointments usually take between 1 and 1 ½ hours for all tests and consultation to be completed in order to minimize need for further testing at a separate visit. Additional time may be necessary depending on the complexity of the tests needed. Please bring all referrals and lab results from your primary care physician. Due to the possible length of your appointment, please make sure you have the necessary supplies for your child including formula, diapers and favorite toys. Child life specialists are also available to help the appointment run smoothly. Please fill out the intake forms prior to your visit.